Planet Earth can be a calm and tranquil place, but certain places on Earth can be very dangerous to a traveler if the traveler is not prepared, and has not taken certain precautions before leaving on their journey. The journey that I’m about to take will see me ride through numerous remote locations, which carry a heightened level of danger because of the terrain, and the remote location itself. In addition to some of these locations being generally dangerous, many of them are also rife with political unrest, and uncertainty. There are many different ways that we can prepare ourselves, in order to mitigate the risks of world travel; We can travel with a body guard, or perhaps only travel to “safe places”, or even travel exclusively using mass transit, or public transit. But none of these choices really solve my problem. I want to travel to these remote places, I won’t be able to travel with a body guard, and I’ll be riding a motorcycle, so opting for public transit won’t work for me. So, what’s the answer? My dual-prong approach relies on keeping my wits about me in all conditions, but more importantly, I’m relying on friends and family to keep an eye on my progress, but I’ve also registered with the US State Department. Registering with the Dept of State ensures that they know the dates that I expect to enter and exit each of the countries along the way. If anything happens, the State Department can quickly get involved, and lend a hand. The other aspect of my approach relies on Friends and Family, as I mentioned above. Specifically, I’ve purchased a GPS Transmitter and tracking device, which is called the DeLorme InReach Explorer, and was originally sold by InReach, who has now been purchased by Garmin. This device is about the size of a small walkie-talkie, but is very sophisticated, and can communicate my whereabouts, with a level of accuracy to within 3′, with data tracks logged each minute of travel. The Explorer is the same device that I used during my last trip, the X-Country trip of 2016. The accuracy is excellent, and the real-time tracking was even used by some friends who were expecting me to arrive at their house, and who could see my progress, and could estimate an ETA to within a minute or two. My buddy Lee even gave me a hard time, telling me that I had arrived a minute or two late, when I arrived at his house in 2016. The DeLorme InReach Explorer is a 2-way, handheld satellite transmitter that sends location data, and is equipped with an SOS function, which can be easily triggered, and which will send an emergency message to recipients on my contact list. After purchasing the Explorer, I have to choose a monthly data plan that suits the type of travel I’ll be enjoying. The data plan allows me to create an unlimited number of TXT messages, which I can send directly from the Explorer, or which can be triggered from my cell phone, when connected to the Explorer by Bluetooth. This plan also allows me to log my location (GPS Coordinates) every minute, and send them to the Satellite every 10 minutes. So, at any point in time, the tracking map will be no more than 10 minutes behind. You can easily reach the tracking map by navigating here, or by selecting [About Tracking -> Real-time Tracking]. Clicking on the link or the menu item will bring up a new page, which shows my most recent activities. On the Left-hand side of the window, you’ll see a number of “collections” listed. There are three of importance. Tracks from my 2016 trip across the US. Any and all test rides that happen before I leave on the World Tour trip. 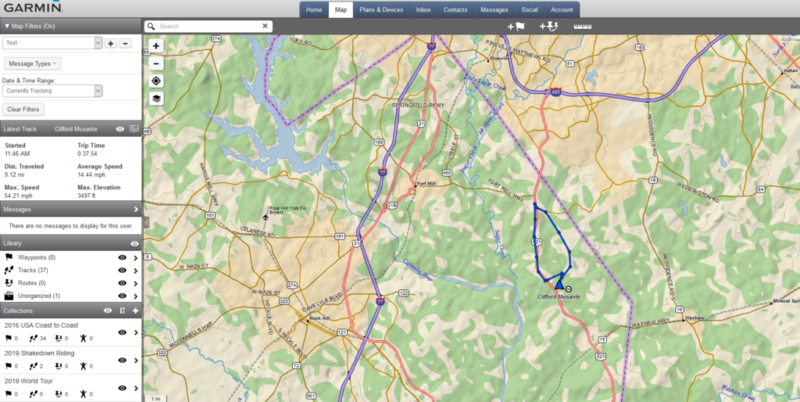 Any and all tracks and way-points that are logged, after starting the trip on July 11, 2019. Select the collection that you’d like to see, and the map will include all of the tracks within that collection. At the present time, and until I figure out how to select the default view, you’ll need to filter out all previous collections, so as to not confuse the current trip, with my trip from 2016. To filter out all previous trips, select the [Map Filters] menu item at the top of the map, and select [Currently Tracking] in the Date and Time field. So, throughout the trip, and even beforehand, I’ll be recording my rides, and fine tuning how the map appears when you click on the link. Remind me when you leave? Are you seeing only remote parts of Russia or also St. Petersburg and Kremlin? Im there in August! Have a great trip!! Hi Jen, I’ll be arriving in St Petersburg on Aug 17, I’ll spend 2 nights there, but I’ll also spend 3 nights in Moscow, and 2 nights in Yekaterinburg as well. If you can send me your itinerary for Russia, I will try to find a way for us to meet up. It would be awesome to see you again, especially if that was in Russia. Pretty cool technology! Your level of prep for this trip has been very interesting to read about. Thanks Ash, I love this stuff, and it’s fun to both prepare, and mitigate risk. Thanks for the shout out….didn’t realize I beat you up so bad…..
Hey Bruce, good to hear from you. It’s easy for me to see how this type of trip is a fantasy or a dream for many of my friends. So, when I ride, I’ll be thinking about you, and all of the others that have always wanted to do this kind of a trip, but because of timing, finance, or other commitments, have not been able to do it. Have a great trip Cliff. I’ll be following your progress. Frank, each time you see a video embedded into a post, you should know that you’re the one that allowed me to start using the Adobe products to get the job done. Seriously, all of the Adobe products are fantastic, and if I can figure out how to develop skills to get to greater than a 10% level of knowledge, I’ll really be dangerous.